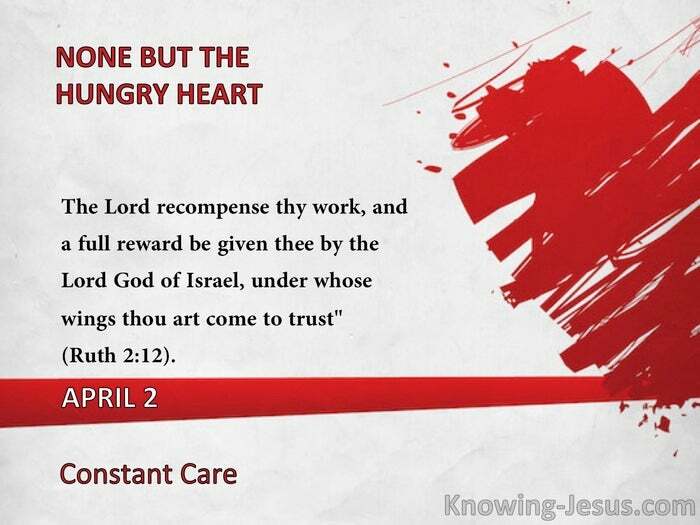 The Lord recompense thy work, and a full reward be given thee by the Lord God of Israel, under whose wings thou art come to trust" (Ruth 2:12). The Lord Jesus not only died for every sin in our life, but He lives for every second of our life. We cannot rest in Him until we realize that there is never an instant that He is not caring for us. It is as though each of His own were His only one. "So many saints are disturbed, so many are restless, because they are not living in the knowledge that they are under the care of the Lord; and then there is no power to walk. Why have you so little power in walk or service? It is because you are not yet clear that the Lord is caring for you, that He is in all watchfulness over you, that He has let down the strong pinions of His protecting care till they sweep the ground around you, and, if you are wise, you will creep up close under His wings, into the very down." -J.B.S. "It belongs to the nature of our pilgrimage and life of faith, that we cannot see the land for which we are bound. If only thou hast bid farewell to thy past, have confidence in thy God; trust Him to bring thee into a better land than the one thou art leaving. Should we find that Divine things do not at present correspond with our hopes, we may be quite sure they will eventually exceed our expectations; we shall realize above all we ask or comprehend." -O.S. 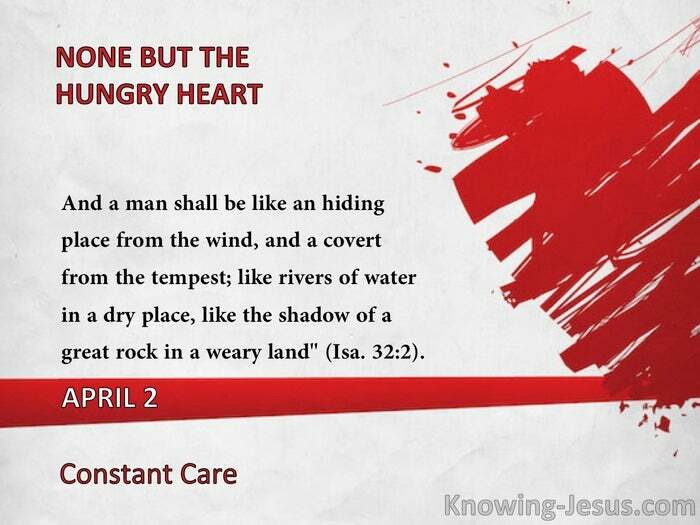 "And a man shall be like an hiding place from the wind, and a covert from the tempest; like rivers of water in a dry place, like the shadow of a great rock in a weary land" (Isa. 32:2).